Board index ‹ The Marketplace ‹ For Sale / Wanted / Group Buys ‹ Not really RCZ, but has the RCZ-R engine. Not really RCZ, but has the RCZ-R engine. Re: Not really RCZ, but has the RCZ-R engine. Not bad. I did look at these before the R, but would have bought a pre reg, as didn't fancy waiting 12 weeks for the spec I wanted. I didn't go for it in the end as I thought having the Z would be more special. Edit: Having said that, the exact spec (i.e Top spec) I wanted says its available now!! £459 per month though. Nice but it's just a Peugeot 308, it doesn't have the looks like the RCZ. My wife has one. Fantastic car and absolutely leaves my 200 THP for dead. I test drove the 308 GTi too. A very good car but a different piece of cake compared to the RCZ R. In the RCZ R you feel more planted and connected to the road. It is more of a driver's car. Nevertheless if I had to choose btw a Golf GTI and the pug 308 my choice would be always french. I didn't buy the RCZ for the engine !!! Strange to read that from a german! Definitely not the case when comparing the THP 200 RCZ to the 308 GTI. The RCZ does feel slightly more stable, possibly due to a longer and wider wheelbase, but the 308 feels way more nimble specially when jumping between the two. The weight difference and extra power are also very apparent. I haven't driven the RCZ-R, but between the regular Z and the 308 GTI, the GTI is a much more capable drivers car. 100% agreed re the golf! Agree. I also test drove the THP200 RCZ and compared to the 308 GTI I totally agree with you. The difference from THP200 to RCZ R is another step up in the game. Yes, the 308 feels nimble and agile. But a lot of it is down to its quick steering rack (which is lovely). The differences between RCZ R and 308 GTI come to light when you start pushing both cars to the limit. Brakes on the R are more "sporty". Engine mapping is different with more focus on higher revs where the 308 pulls more in the lower rpms but gives up on the higher range. Etc. etc. I love the 308 GTI, honestly. Great car. It is a perfect mix of daily driver and a bit of a hooligan. But if I had to choose, I'd always take the RCZ R for its uncompromising focus. Spot on mate. I'd love to throw an R into some corners one day. Both cars have identical 380mm Alcon brakes though (with the 308 GTI being between 100 and 200kg lighter depending on which site you read) and as far as I can tell the engines are also identical? Both 200kw/330nm. Was there actually an updated tune on the 308? Anyway, I'm 100% agreed mate. I'd pick the RCZ-R over a 308 for the looks alone. Unfortunately we needed the practicality for my wife's car. The other day was thinking of changing car, got a quote from carwow. The 308GTI, all options (to be honest, not many, as a lot is standard, great news), have been offered some for as low as 20k. The original price was 30.800, the offer was 20.700. Considering the discount, for a unregistred car, can't see anything offering a better value. Most of the potential depreciation is already taken by the discount, so if owning for let's say 2 or 3 years, considering the paid amount and the actual price, the loss would be acceptable. Much better than paying 25k or 27k in a equivalent car and after that period, see that the actual value for it is similar to the Peugeot, that cost 5 to 7 grand less. Already bought two car using carwow, and they offer all the facilities as a dealer, as the selling agents there are, in fact, dealers biding to sell you a car. Similar sites offer the same facilities. Buyer beware of these sites, the law has changed and if the "Agent" holds on to the V5c ( log book ) and promises to give you it say 6 months later - then this is definitely against the law. You would not be insured as you are not the lawful keeper and you don't hold the log book. If it is different to this, step careful is all I am saying - the old adage is true - if it's to good to be true, it usually is ! The numbers are good and your thinking re; depreciation is spot on, just be careful. What happens is that some dealers to get a good discount with Peugeot or any other brand, have to be the first owners for some time, let's say 6 months. Other dealers, get their discount using high volume of sales, reducing the profit, but getting a better price from the manufacturer. That's why it can happen, and in that situation the person would be a second owner. I would refuse if the car was sold as unregistered. All the experience I've had buying from dealers using carwow, it never happened, but I had seen in Honest John some problems. In fact, when using such services, it gives me an upper hand to get a better deal locally, as Cambridge holds some higher prices as standard, don't ask me why. To use such services, I would always make sure that I will be the first owner of the car, and get the documents within reasonable time. Price wise, it's consistent. In my quote, the values were 20.700, 21.200 and 22.000. As I mentioned before, Cambridge Peugeot, no discount. Some dealers would accept part exchange, others not. My advice is even if you have the money for a cash buy, use PCP, get the discount, wait for the document to arrive, as the finance company would be of help if there's a problem. Once all sorted, pay off the finance. Usually PCP offers a lower price too. When I trade my RCZ for a new Sportage, buying using carwow, the dealer from kia was Coventry. 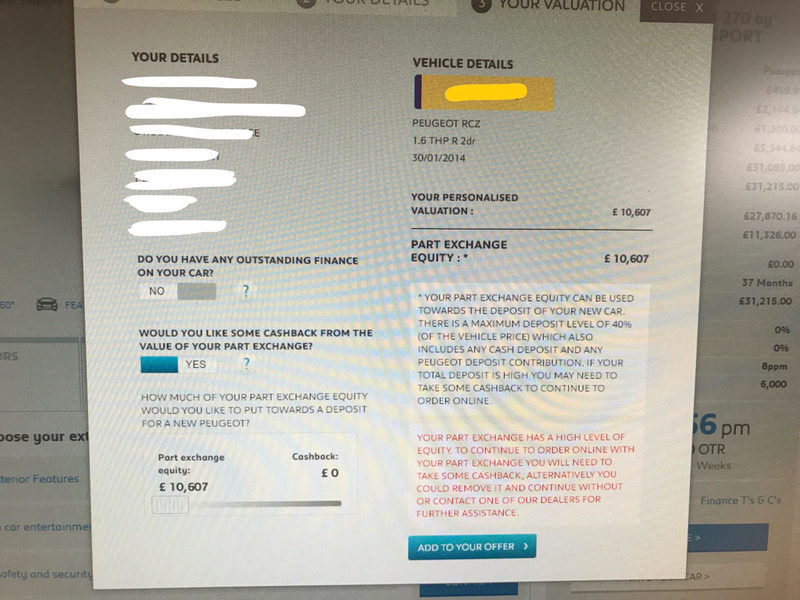 Even the part exchange value was better than what I was offered around. Your advice is valid, always be careful, but as in my quote, the offers are similar, I'm guessing that Peugeot is giving the dealers some margin to sell more GTIs. ...and as far as I can tell the engines are also identical? Both 200kw/330nm. Was there actually an updated tune on the 308? The 308's engine has definitely a different mapping. It pulls stronger from low down and has different response compared to RCZ's engine. RCZ's engine revs higher and does that more willingly. If I got it right, also the exhaust header is different to the RCZ's one. Cost-wise decision. Or like there are the same size brake discs, but not the same weight-saving construction of the disc like you get on the RCZ. And the slotted surface. But on the 308 you get them cheaper. Makes you think for longer ownership. Gear selector has a longer throw on the 308. Brake feel on the 308 is more spiky, where on the first centimeters of pedal way you get a lot of brake servo. On the RCZ you get that perfect linear brake servo and brake feel. You can step on them hard and still modulate the braking power with fractures of pedal movement. But all those are nuances which not everyone will notice. It's impossible to compare a hot hatch with a coupe, specially considering how nice the RCZ was and at a reasonable price. Quite often people would say that the car was more expensive than it actually was. Not the non-sense idiots mentioning french cars and their electrical faults from the 70's. As the RCZ isn't available for sale, the 308 GTI is a very decent car, but can't say it's a replacement for the RCZ. Considering how many TTs, RCZs and other coupes are around, can't understand Peugeot decision. For sure the RCZ was a car bringing some good focus for Peugeot as a brand. But seems like the very next thing if opting for Peugeot is the 308 GTI. Don't get me wrong. A very good car, but not able to wear RCZ's shoes. In my opnion a better choice than a Golf GTI. Hot hatch wise, considering the price, I would be between a Cupra and a 308GTI. Don't like the design of the Focus and it's interior, the good Golf R is much more expensive and can't justify the price. As I mentioned in another post, the 308 have lots of goodies as standard. Plecodoras there are a couple of un-read messages in your inbox from me!!!!! I test drove the 308 GTi last month (for the second time) and it is fantastic drivers car. The brakes are phenomenal and you can really feel that LSD working underneath. The test car was an ex demo but the dealer was asking for too much money for it. I begrudgingly walked away. The car is still for sale today. The GTi is extremely rare over here.